For 18 years Fred Olsen had a loose bone splint in his foot, which caused severe pain. The doctors did not find what caused this, but during a meeting in Oslo in 1997 he was healed. One spring day in 1979, Fred Olsen was out driving his motorcycle on a road in Bø i Vesterålen. Suddenly there was an obstacle in the road, causing him to end up in the ditch. Olsen's bike landed over his foot, which was very painful. Nevertheless he managed to drive home. The coming year would still prove to be very painful for Olsen. -My foot was in constant pain, and every time I put pressure on my foot, it swelled up and became inflamed. I worked on a boat and as a travelling salesman, and my foot was in pain and prevented me from doing much of the work. The doctor thought I was too healthy to be receiving disability benefits, but too feeble to work a lot. He tried to figure out the problem, but did not come up with any answer. In 1985, Olsen was in the military. At the hospital the doctor discovered that he had a torn ligament. Olsen had an operation, but he still did not recover. -It was absolutely terrible. The next twelve years consisted of many problems. I was in and out of check-ups, used painkillers, was on sickleave, and did not do much physical activity. I had always been an active man in various sports and enjoyed wandering in nature and in the mountains. Now I had to assess the number of steps I took each day to limit the load. Life was so very frustrating. In 1997, Olsen was desperate for help and described himself as both puzzled, disoriented and distressed. What was he to do and how could he get help? By chance he saw an ad in a newspaper that Svein-Magne Pedersen was having miracle meetings in a conference center in Oslo. -I knew who he was, and my mother had talked a bit about him, but I had little experience with Christian things and certainly not healing. Olsen decided regardless to attend the meeting. It was a big meeting and a lot of people. Even national TV was there to make a report. Olsen started getting cold feet and was considering going home, but decided to stay at the meeting. -In front of me in the queue stood a woman who had chronic arthritis and walked with crutches. When Pedersen prayed for her, I saw how her back straightened up, and she could walk without crutches. It shocked me, but soon I was even more surprised. 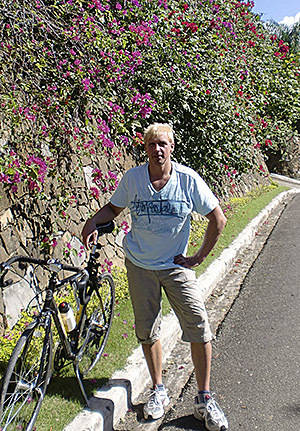 When Svein-Magne prayed for me, I felt a warmth go down my leg, and the pain disappeared. In the following days the foot was still healed. A few days before the meeting with Pedersen, Olsen's family doctor had sent him to a special clinic in Oslo. Here there were new examinations done, and after many years of fumbling around in the dark, there was finally a doctor who found the cause of the pain in his foot. -The doctor found a loose fragment in the foot. It measured 13 millimeters, and created irritation of the nerves and blood vessels. I was therefore sceduled for surgery. Although the pain in the foot was now gone after the prayer, Olsen chose however, to show up at his appointment to have the operation, so the doctor could check his leg. When the doctor came in to look at the injury, he found nothing and was astonished. -I told him what had happened. "We can not entrust our health to the spiritual," the doctor replied, and tried to explain away what had happened. I know it was God who fixed my foot. Since I had been been walking around with these ailments for 18 years, and they had not been able to help me, Jesus should have the credit. In the years that followed, the foot had been fine. He is now working, exercising, hiking, kayaking, scuba diving and doing fitness. Some time ago he experienced God intervening in his life. -I had struggled with a sore neck in almost 15 years, the pain came and went. In November 2012, I therefore called the prayer phone, and after that my neck has been in good shape. Too many people are standing there with their heads in the medicine cabinet with a completely wrong mentality. We need to educate people that God can heal as he did with me, says Olsen.